Konjac fiber for a sense of satiety and relief from constipation. Konjac is an Asian herb containing water-soluble fiber capable of extremely high absorption of liquids. Konjac'sdietary fiber is comprised of a polysachharide called glucomannan. When konjac glucomannan (KGM) fibers come in contact with water, they swell considerably, forming a relativelydense gel that fills the digestive system and creates a feeling of satiety, as if one had eaten a filling meal. Glokomnan fibers are produced from the bulbs of the konjac plant. 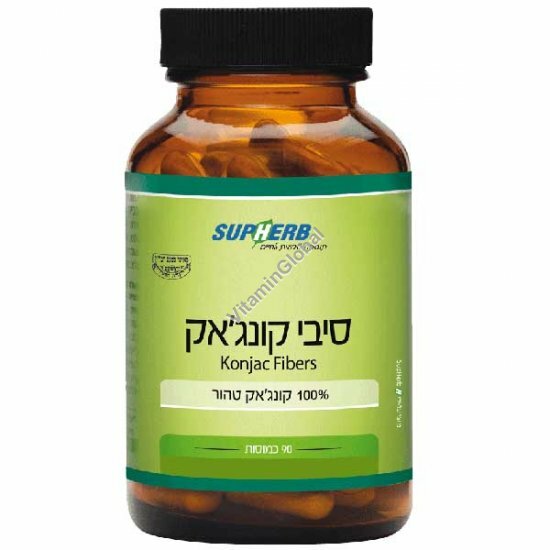 SupHerb's konjac capsules contain 100% pure fiber, capable of absorbing up to 200 times their weight! In Japanese cuisine, the plant, known by the cognate konnyaku (and devil's tongue in English) is used to makea sweetened gelatin served much like sushi. The gel, which still has a high fiber content, has long been used by the Japanese to support the digestive system health and as an effective laxative. Numerous studies have confirmed that people who take konjac regularly are successful at losing weight, and simultaneously find that their digestive flora improve along with their bowel movements. Now SubHerb has brought the diet and digestive benefits of konjac fiber to you in the form of a convenient and affordable capsule. Directions: Take 1-3 capsules per day, with 1-2 glasses of water half an hour before a meal. Pregnant women, nursing mothers, people taking prescription medication and parents considering this product for their children should consult a doctor. This information is not medical advice and not indicatory. In case of a medical problem, contact your physician.